The National AgrAbility Project produces news-related publications, listed below, that share success stories, discuss available resources, announce and/or report on special events, address current and emerging assistive technologies, and cover various other topics of interest. 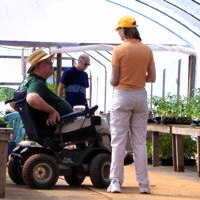 AgrAbility Harvest is a newsletter that highlights the activities and impacts of AgrAbility, and is designed for agricultural producers, AgrAbility staff members, rehabilitation specialists, agriculture professionals, educators, legislators, or anyone else with an interest in the agriculture and disability arena. It is published in both electronic and print formats. To a receive printed copy or to be added to the email list for electronic copies, please use our Contact Us form. Be sure to include your mailing address if you want a printed copy. The AgrAbility e-Note is a monthly electronic publication primarily targeting AgrAbility staff members, but containing information that may be of interest to others. It focuses on current activities from the National and State/Regional AgrAbility Projects, and contains listings of upcoming events, plus links to stories about AgrAbility from other media outlets.